What's New in Metal Clay? This page provides you with a quick idea of what’s new in metal clay and what’s been added in the past month. If you are a regular visitor, you can see what we’ve added since your last visit here. Metal clay is a constantly evolving medium so keeping up with what’s new in metal clay is quite a task! 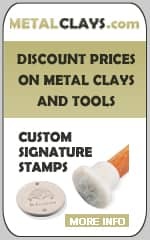 If you know of something new or you are working on something that you’d like us to promote, contact us so we make sure our visitors are always aware of what’s new in metal clay. Great overview of the firing schedules for mixed metal clays using Hadar’s range of bronze and copper clays. 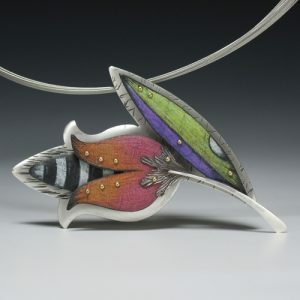 Classes cover all levels of metal clay, from beginner through senior instructor. Kick your boots off and immerse yourself in a blend of past and present as we travel to the Heart of Austin for a unique 4-day workshop experience. Hosted by your friends at Kiln Frog, you’ll spend 5 nights at the ultracool and retro-inspired, Lone Star Court Hotel, soaking up the hip Austin vibes of great music, great food, and modern luxury in Austin’s newest hipster paradise, The Domain! Featuring Texas Artists, Vickie Hallmark, and Gail Stouffer. Download a flyer with details here. You have spent the time making a unique item, why would you use a mass produced clasp or hook? Make your own and let people know you thought about the smallest details. In this video, the first of a series, learn how to create three different easy and beautiful hook clasps. Art House located in Highland Village, TX holds beginning and intermediate Metal Clay 1 day Workshops along with Metal Clay Project classes held each week. 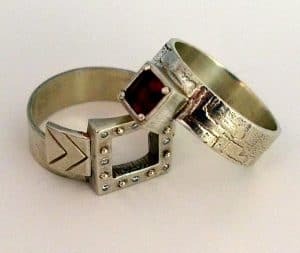 In this video, Professor John Ahr of the Online Jewelry Academy demonstrates how to sweat solder a fine silver (.999) bezel cup to a ring. And, he finishes by setting the bezel with a 6mm round cabochon stone. Among the most common metalsmithing tools is the jeweler’s saw. Even beginner metalworkers who don’t solder yet will likely use a jeweler’s saw at one point. Metal shears can do many jobs. A jeweler’s saw allows you to cut very intricate shapes, holes, or other shapes inside a piece of metal sheet. Before you start using a jeweler’s saw, it’s important to understand a few important things about this essential tool. Quick and easy fingerprint charms tutorial for Creative Fire. This trailer is for an advanced level course with Jewellers Academy. This course is not free but it is a comprehensive course for more advanced metal clay artists. Challenging project by Tracey Spurgin for Creative Fire. Artist, Instructor and Silhouette Curio expert, Cindy Pope started out with Precious Metal Clay Rio certification and metalsmithing classes and is one of Hadar Jacobson’s first Cadre of Base Metal Accredited teachers. In this video, Cindy switches gears from using the curio to creating fun, simple paper punch earrings using a thinly rolled sheet of EZ960 Sterling Silver Clay. She completes these layered flower earrings by adding a 4mm cubic zirconia which is sandwiched in place by 2 washer style pieces of greenware sheet. To minimize waste and create another version, Cindy uses a circle template to create the reverse look for a second pair. This is a general energy consumption site but it tells you how to calculate how much energy you are using. It’s great to see how much energy your kiln uses during firing. This page has lots of information about this small starter kilns. 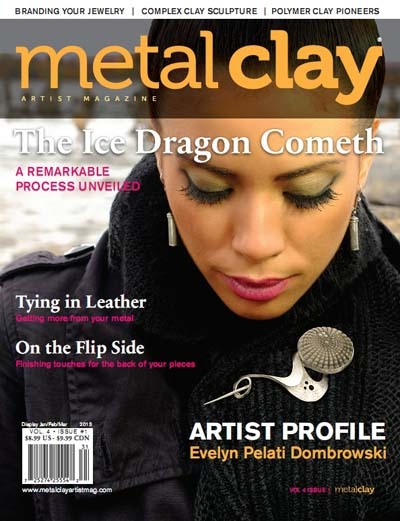 Interesting article about firing metal clay on the Creative Fire website. Margaret Schindel has a huge amount of great articles about working with metal clay on this Felt Magnet. The link above takes you to a search page which lists her articles. If you’re just starting out with metal clay or jewelry making in general, getting started can seem overwhelming. The following tips will help you get started with confidence. How to make homemade metal clay oil paste with Sherri Haab PasteMaker solution, lavender oil or another plant-based pure essential oil and use it to make strong, secure joins. 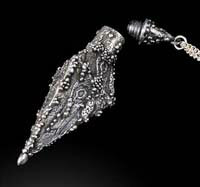 Article by Lis-el Crowley about working with silver metal clay. This Basic design Presentation serves the purpose of initiating creativity and there by appreciation of visual language. This store mainly supplies loose pearls, pearl strands and final pearl pieces made by the shop owner. All pearls in the store are hand-selected with 100% guarantee of be REAL Chinese Cultured Freshwater Pearls. Earring wires are just one of the many ways you can go about adding a creative handmade touch to your design. Depending upon the beads being used, your earring wire can help accentuate the style of your piece. With only some wire and a few other tools, you can create your own earring wire design. Here is a look at some great creative earring wire designs to make today. Lots of useful stuff on this blog. It hasn’t been updated for a while but there are some real gems that are worth looking for. UK supplier of stones and cabochons. Bead World features a fine selection of traditional and ethnic pieces, old and new, as well a lots of beads, beads, beads! 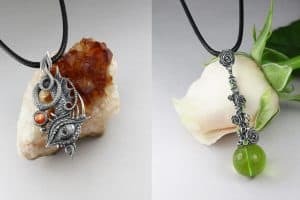 They have Semi precious stones, Swarovski Crystal, freshwater pearls, wood, bone, and other natural material beads, a great selection of glass from the Czech Republic, Vintage German Beads, fiber optic beads, sterling silver beads, findings and clasps in silver, 14K gold filled, copper and base metals. Bead World has a large selection of hand made Indonesian glass beads as well. Pre-conference workshops, 13th-14th August. Conference 15th – 18th August. Booking is now open. Metal Clay Mojo is an all inclusive experience combining a variety of professional and inspiring presentations, round table discussions, community building and lots of fun. It is also designed to be affordable, with one fee covering the conference, meals and accommodations, and even after hours cocktails. Travel and personal purchases from vendors would be the only other cost. 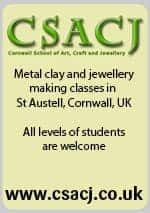 Metal clay instructors Despina Buoncristiani and Georgina Brown are both teaching classes at this show. Pixpa’s easy, drag-and-drop website builder enables you to create your own beautiful portfolio website without any coding experience. Choose from fully customisable, stunning website themes to showcase your work. Your mobile-ready, online portfolio website comes with all the features and tools you need to grow your creative business. Cyprus Copper Clay was released in November 2018. Developed by Cindy Silas, Cyprus Copper Clay is an excellent base metal clay medium for jewelry, crafts, sculpture and models. Offered in lump (wet) form, this clay is waterbased, air dries and fires to .999 pure copper. Economical, easy to form, fire and finish, the fired clay presents as beautiful on its own or as the perfect platform for enameling projects.